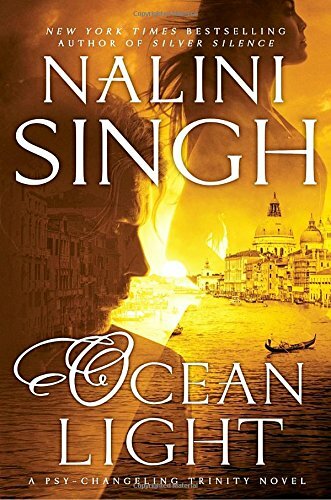 In Ocean Light, Nalini Singh returns to her Psy-Changeling world with a close look at the intriguing but seldom featured Black Sea changelings. Oceanic changelings are vanishing, taken from the sea far from their homes and marked so that no teleporter can get a lock to locate them. The kidnappings were mentioned in earlier books but become the focus in this one. This story is a special treat for those who’ve wanted to know more about the BlackSea group. The heroine, Kaia Luna, is a chef and healer at one of BlackSea’s installations. Currently among the missing is one of her closest friends, a male who told her the Human Alliance, the third leg of the Psy/Changeling Trinity, was behind the vanishings. Kaia is thus less than thrilled when the Human Alliance’s security chief becomes a patient at her cousin’s clinic. The security chief, Bowen Knight, is the hero. Like many members of the Alliance, he has a chip in his brain to prevent Psy intrusion. The chips are all now degrading, dooming those who have them implanted. Bowen suffered a gunshot wound that should have been fatal, and his last request to his sister was that she use his brain, meaning that experiments on it might lead to stopping the degradation of the chips and saving others. Bowen didn’t die, but he’s at BlackSea to undergo an experimental protocol designed to stabilize the chips. It’s not expected to succeed, but the data it yields should contribute to a solution down the road. Bo has approximately two weeks left before he suffers catastrophic brain damage. From the first, Kaia and Bowen are drawn together. She resists because of her suspicions about the Human Alliance and his prominent role in it, and he is all too aware that his time is running out. She also knows he’ll have to live on land, and nothing good has ever happened to her there. The idea of going onto land distresses her so much that she has to be medicated to handle it. He’d said something to Lily before he died. He’d told his sister to use his brain. Maybe he wouldn’t have said that if he’d realized he’d still be conscious while his brain was being chopped up. Bo frowned … Could a brain frown? And why was his brain talking back to him in such a coolly affronted tone of voice? Had it gone insane while being a disembodied brain in a jar that someone was experimenting on? Further down: He’d really thought he could trust Lily to make certain he was actually dead when his brain was put into a jar. He’s not a disembodied brain in a jar, of course, but the exchange is humorous and kind of sweet. A running exchange between Kaia and Bowen involves his trying to find out what her changeling form is and her refusing to tell him. It then becomes fun for the reader to try to guess, too. The worldbuilding, as usual, is excellent, and having Kaia view her clanmates’ forms through a chef’s eyes, focused on what they like to eat, is a nice touch. At one point, Kaia shows Bowen a passing family of bioluminescent Medusozoa, who are changelings and don’t like to be called jellyfish even though they resemble them. BlackSea also includes walruses, whales, an ancient turtle, and a great white shark, among others. Finding a path forward isn’t easy for Kaia and Bowen, and not everyone wants the experimental protocol to succeed. Working against their various obstacles brings them closer and leads them to their own happy ending. My only quibble with this book is that a major event had a lot of buildup and then was over in a couple of pages. Otherwise, I loved everything about it. Readers, do you enjoy paranormal romance? Are you reading Nalini Singh's Psy-Changeling series? What draws you to - or pushes you away from - reading paranormal romances? One randomly chosen person who posts a comment will receive a copy of Ocean Light. I haven't read Nalini Singh's series but would enjoy this new release greatly. Paranormal is a wonderful escape. I've read and enjoyed other paranormal romances and mysteries although I have come across some that I couldn't force myself to finish. For me to truly enjoy any type of story, the characters must be fully developed and the plot credible. Also, throw in some excitement and humor. I have tried paranormal once but maybe it is time to try again. I really enjoy paranormal romance and the Psy/Changeling series is one that I follow. Paranormal stories fascinate me for the sheer creativity and often awesome world building. I read a couple of the Psy-Changeling books when I was sampling the paranormal genre. They were very different and I thoroughly enjoyed them. The world building is wonderfully done, creating something so very different from anything else I have read. I have another on my TBR mountain and really would like to sit down and binge read the whole series. This one intrigues me. I am interested in seeing how Bowen deals with having such a dire prognosis for his future. Kaia is aware of his condition, so how does she deal with it? What happens to give the an HEA? I love paranormal romance, normal rules don't apply so it's fun when you learn about new worlds and their rules and what makes them tick.